A Million-Mom Army And A Billionaire Take On The NRA What happens when a billionaire businessman and politician teams up with a moms-against-gun-violence group with millions of supporters? 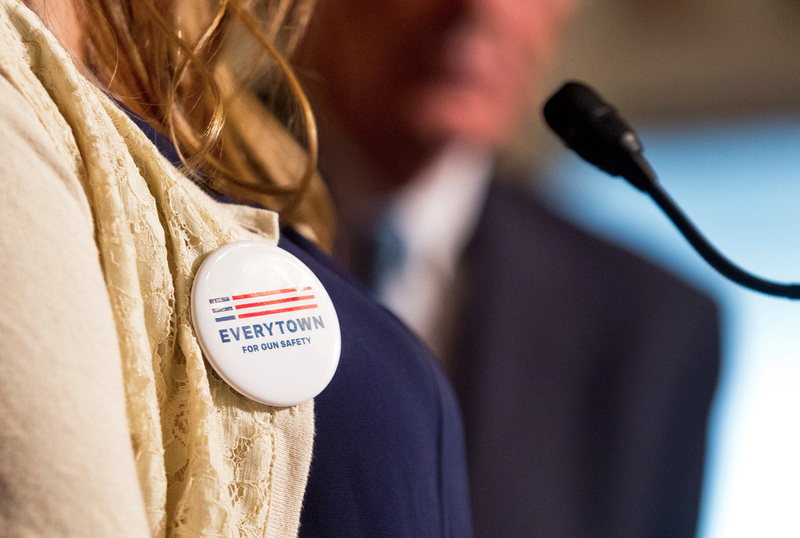 Everytown for Gun Safety teaches survivors of shootings how to use their stories to advocate for gun control legislation. Yesterday on Capitol Hill, Tina Meins and other survivors of gun violence joined Democratic senators to push for tougher gun control laws. In the San Bernardino mass killing last year, Meins' father and 13 of his co-workers were shot to death. "In mere seconds, my life and the lives of my mother and sister were irrevocably changed," she says. 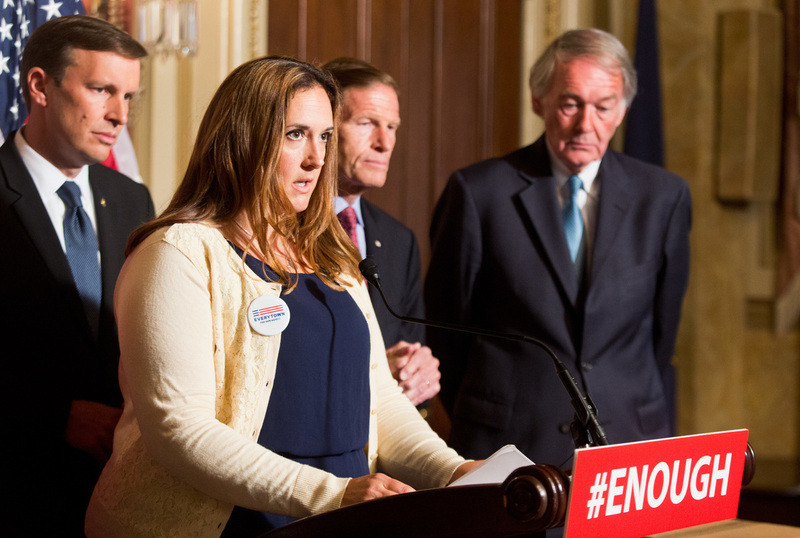 It's no accident that an articulate daughter of a shooting victim was up at the podium with the senators: In the past few years, a powerful new gun control group has emerged, called Everytown for Gun Safety. It trained Tina Meins and more than 800 other gun violence survivors to meet with politicians, speak in public and write op-eds as part of a growing nationwide movement. "I think about my dad every single day," said Meins, holding back tears and flanked by Sens. Dianne Feinstein and Charles Schumer. "I lost my father, my best friend. I want my story to remind others that it doesn't have to be this way." Pushing for the universal background check and "terror gap" laws, Meins told the assembled members of the media, "It's time we take a stand in this country and disarm hate." The National Rifle Association has been a gun-lobbying superpower for generations, but no gun control group had anywhere near the money, political power or boots on the ground. That is, until now. Gun safety advocates now have their own goliath, and this gun-violence survivor network is just one part of the group. Everytown has billionaires on its board, political know-how and a 3 million-strong citizen army of moms against gun violence. And they are bringing the fight to the NRA. Much of the groundswell behind this crusade comes from people pulled into it for their own reasons. Shannon Watts was folding her kids' laundry when news broke of the mass murder at Sandy Hook Elementary School in Newtown, Conn. Watts was 800 miles away in her home in Zionsville, Ind. Like any American, she'd watched news coverage of shootings before. But these were grade-school children — 6- and 7-year-olds shot dead in their first-grade classrooms. Watts wanted to do something. "I was obviously devastated, but I was also angry," she says. Watts went online and started searching for some kind of group to join or to donate money to. "I thought surely there is a Mothers Against Drunk Driving for gun safety," she says. "And I couldn't find anything." Watts says she had never gotten involved in politics before, beyond making some political contributions over the years. But she made a Facebook page: "One Million Moms for Gun Control." Watts only had 75 friends on her personal Facebook page, but she remembers watching the likes on this new page go from the hundreds to the thousands to the tens of thousands. "It was amazing," she says. Eventually 1 million wasn't big enough, and Watts changed the name to "Moms Demand Action." Watts says she never imagined starting a grass-roots movement, but actually her career made her particularly good at it: For most of her adult life Watts worked in corporate communications. And not just as a lower-level PR person. Watts was a director of public and corporate affairs at the agricultural giant Monsanto. And she went on to become a vice president and corporate officer at WellPoint, where, she says, she led a 40-member communications team at one of the biggest insurance companies in the country. Watts says that experience has been "hugely helpful" building her Moms Demand Action group. As the group grew, she caught the notice of Michael Bloomberg. The billionaire former mayor of New York was already active in gun control and was getting ready to launch Everytown for Gun Safety with a pledge of $50 million. But for all the group's funding and political influence — Everytown grew out of "Mayors Against Illegal Guns" and today has 100,000 donors — it lacked foot soldiers. "That's what made this marriage such a good pairing," Watts says. "We already had the boots on the ground. We had the army." Today the two groups have merged and together have some 3.5 million supporters. Tina Meins, the daughter of a San Bernardino shooting victim, calls for gun control legislation during a Senate press conference on Thursday. The "Moms" group's members regularly turn out for rallies at statehouses around the country to push for new, Everytown-backed gun-safety legislation. Watts has been to the White House and Congress as well to press for change — and since this latest shooting in Orlando, the push at the federal level is getting more intense. On Wednesday evening, Jennifer Herrera spoke with local politicians at a vigil in front of City Hall in Alexandria, Va. She's the state chapter leader for the group. "My sorrow over the tragedy in Orlando runs deep," she says, "but make no mistake, we are making strides every single day." "Yes, we are," someone in the crowd shouts back amid applause. Everytown says it's modeling its strategy after the marriage equality fight, passing laws at the state level where they have popular support. And the group is getting some results. So far, in Alabama, South Carolina, Louisiana, Oregon and nine other states, Everytown has helped push through legislation to block domestic abusers from owning a gun. In some contests the group has outspent the NRA and won. In 2014, it got universal background checks passed in the state of Washington, and it has similar initiatives on the ballots in Nevada and Maine. What does the National Rifle Association think about all this? Jennifer Baker, a spokeswoman for the NRA, says Everytown for Gun Safety is not actually making Americans any safer. "Absolutely not," says Baker. "They are a front group for Michael Bloomberg's gun control agenda. None of the proposals they are pushing would have prevented any of the high-profile tragedies that they exploit as a reason for pushing this agenda." 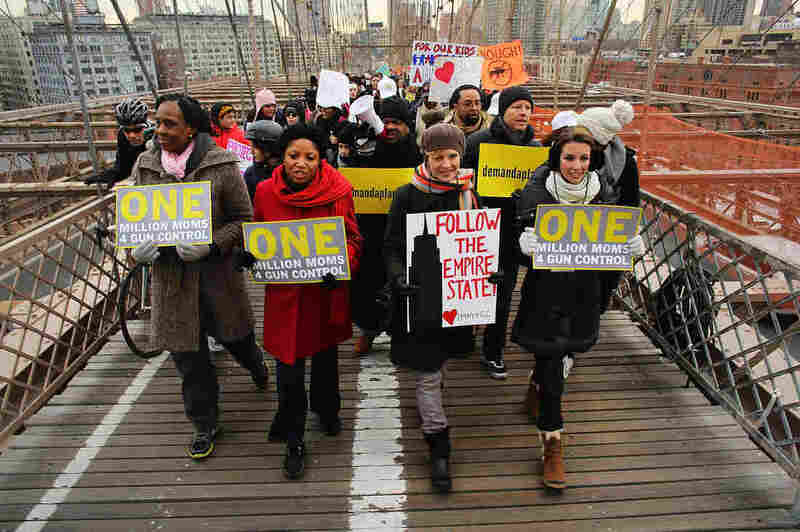 Participants with One Million Moms for Gun Control, a gun control group formed in the wake of the mass shooting at a Newtown, Conn., elementary school, hold a rally and march across the Brooklyn Bridge in New York City in January 2013. Shannon Watts says it's not true that tougher gun laws don't stop shootings, and that Everytown's effort is not a part of some liberal scheme to take Americans' guns away. "Many of our moms are actually gun owners — some of them are in the NRA," she says, and others are married to NRA members. "So this is not in any way about being anti-gun." Watts says members of her group believe that "common sense" gun laws "can go hand in hand with the Second Amendment" — and that most Americans, the Supreme Court, and even most gun owners agree with that. "It's really just the gun lobby leadership that disagrees," she says. Watts says what unites and emboldens many of the moms in her group is that they want to protect their children — something the Sandy Hook attack brought home for her and many others. Still, Watts says she gets some pretty disturbing phone calls and other messages. "The death threats started day one," she says, and threats of sexual violence also are common. "People driving by my home, mailing me letters. ... I have seen an underbelly of America that I never knew existed." 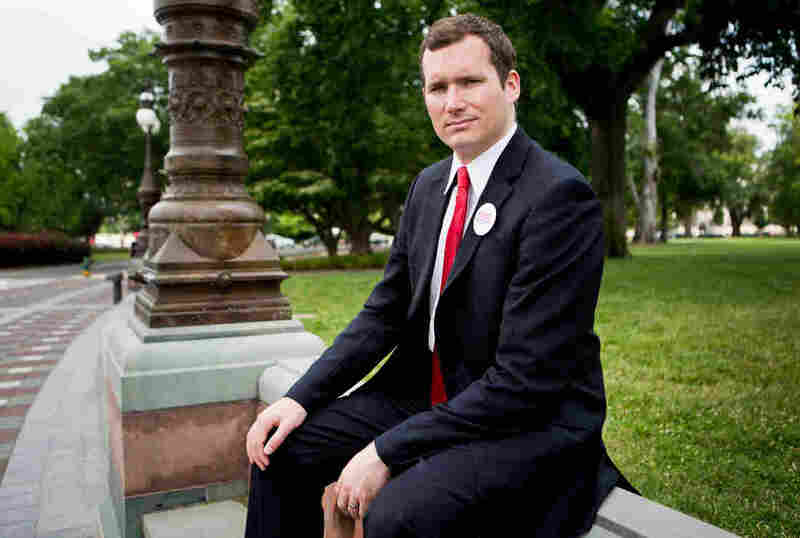 Colin Goddard is a survivor of the Virginia Tech shootings and works with Everytown for Gun Safety to teach other survivors how to tell their stories. She says that, in states that allow "open carry" of guns, groups of men will show up to Moms Demand Action meetings holding assault rifles, pistols and other firearms, trying to look intimidating. But she says the moms at the meetings are pretty "badass" and often diffuse the tension. At a recent meeting in Kentucky, she says, the moms got some of the 11 armed men who showed up to wear "Moms Demand Action" pins by the end of the meeting. One of the leaders of Everytown's survivor network says he doesn't want to take away law-abiding Americans' guns, either. Colin Goddard was in Army ROTC, and learned rifle marksmanship while attending Virginia Tech. He was in his French class there on April 16, 2007, when the campus shooting started. "We heard this loud bang-bang-bang coming from outside of our classroom," he says. His teacher, Jocelyne Couture-Nowak, was going toward the door to see what was happening when the shooter burst in. Goddard remembers more gunshots, and then "everyone hit the floor." Goddard had his head under his desk. Students were getting shot. There was screaming. A bullet hit him in his thigh. "I felt like I was kicked as hard as I'd ever been kicked in my life, above my knee, which shook my whole body," Goddard says. "It was like a sharp burning feeling." The gunman stood over Goddard, shot him three more times, then turned the gun on himself as police reached the room. By then, 10 students in that French class alone were dead, along with Goddard's teacher. "I loved that teacher," Goddard says. "Madame Couture was the best teacher I ever had." She was found at the front of the classroom at the door. "I had one glimpse into the room as I was being dragged out by the EMTs ... shell casings everywhere and blood and bodies on the floor," he says. "It was insanity." Today, Goddard is trying to combat that insanity, teaching other survivors — 850 and counting — how to engage in advocacy. But after the press conference in Washington yesterday, he told NPR that every time another one of these shootings happens, he has to wonder if any of his efforts are doing any good. "It brings you to despair and sadness" in the first days after a shooting, he says — and then another emotion takes over. "Anger. And then you have to find a way to use it to strengthen your resolve to keep fighting and keep pushing." Shannon Watts says that, despite this latest horrible mass shooting in Orlando, right now she's feeling hopeful. In the past week, her group organized more than 50 vigils, met with scores of lawmakers, made 52,000 volunteer phone calls to members of Congress, and sent in more than 100,000 petition signatures urging congressional action. "That's amazing grass-roots power," Watts says. "Our side has never had that before. The NRA has been able to generate outrage and emails and phone calls and rallies with the flip of a switch. And we can do that now too." Just what if anything might get passed in Congress is yet to be seen, but one thing appears clear: There are now two gun-lobbying superpowers in this country. And Watts thinks that's shifting the landscape in a big way. Update June 23: This story has been edited to reflect the information in this correction. This report previously referred to Shannon Watts as one in a group of "regular people" who began advocating for stricter gun control measures in recent years. After the December 2012 shootings at Sandy Hook Elementary School in Newtown, Conn., she created the "One Million Moms for Gun Control" Facebook page. It later became "Moms Demand Action for Gun Sense in America." We should have noted that Watts has a background in corporate communications. From 1998 to mid-2012, she was a corporate communications executive or consultant at such companies as Monsanto and FleishmanHillard. Before that, Watts had what she says was a nonpolitical job as a public affairs officer in the Missouri state government. Our report also stated that Watts had never "done anything political" before the shootings at Sandy Hook. We should have noted that Federal Election Commission records show she began contributing money to Democratic campaigns and political action committees earlier in 2012. According to those records, she has made about $10,000 in such contributions, and about one-third were made before the Sandy Hook shootings.